WooCommerce Smart Coupons lets customers buy gift certificates, store credits or coupons easily. They can use purchased credits themselves or gift to someone else. 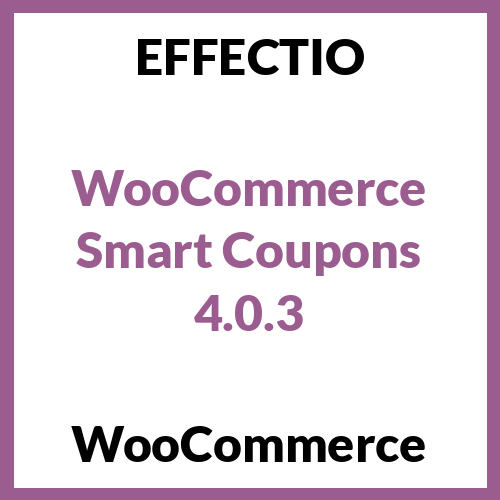 WooCommerce Smart Coupons enables your clients to instantly issue coupons on item acquisitions and to purchase credits for themselves or gift to others. Thousands of shop managers count on Smart Coupons everyday – making it one of the most preferred WooCommerce extensions for marketing. Test this coupon plugin if you wish to see your clients producing coupon codes. First of all, you download the .zip file from your WooCommerce account. Secondly, you go to Add New to upload the file that you have downloaded. Then, you Activate the extension. In the end, you will be redirected to the Welcome Page of Smart Coupons. Generate coupons of a new kind. Distinctive coupon code generation for all credits/gift certificates. Automatic Balance Maintenance – Credit coupon stability is decreased instantly. Automatic Deletion on Zero Balance – Credit/certificate is deleted automatically when balance reaches zero. Therefore, you do not need to invest time on this. Connect as many coupons as you prefer with an item. Practical and familiar coupon management interface. Establish expiry dates of coupons in Days, Weeks, Months & Years. 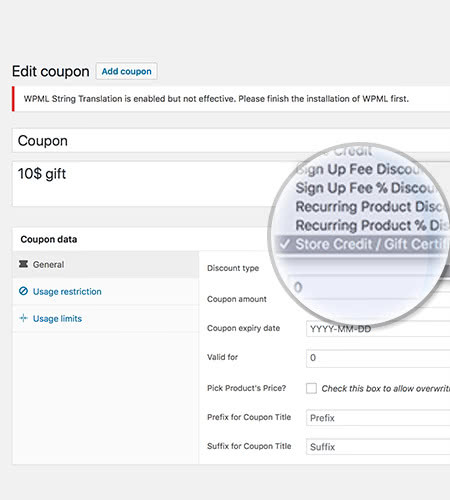 Alternative to choose the product’s price as the coupon’s quantity – enable your clients to purchase any credit amount from single product using this coupon plugin. 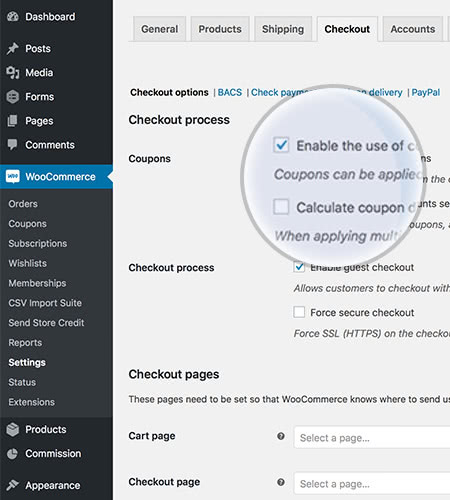 The first thing you have to do in order to add coupons is to go to WooCommerce > Coupons. Then, click Add new coupon. If you want a credit-based coupon, Store Credit or Gift Certificate, use Store Credit/Gift Certificate as the type. After that, you can Add other coupon details and just click Save after you finish. If you need help or any other details, you can go to Coupon Management and set up restrictions by usage, email address or other limits. Any coupon can be utilized as a template to auto-generate new and distinctive coupons but along with the same characteristics as the original. This function can also improve safety, because people can’t share coupons since auto-generated coupons are limited to a client email address. In order to set up auto-generation, you have to go to Add new coupon, or go to an existing coupon. After that, go to Auto Generation of Coupon and enable. Also, you can set up a prefix or a suffix if you wish. In the end, all you have to do is click save and everything is ready. Discover your common order size, for instance $175. By using this coupon plugin, you can generate a Store Credit / Gift Certificate coupon for greater sum – $250. Produce a new item and price it at a worth a bit over typical order size. In this situation, the new item can be priced at $200. Make sure the discount is profitable enough. What you’ve just done is attracted your clients with a great discount, made them pay in advance, and continue purchasing in future to diminish their credit balance. Generate a discount coupon and enable usage just on a particular higher priced item. Connect this coupon with an associated lower priced item. In this way, more people will purchase the lower priced item and many of them will change to higher priced item, too. The more, the better! Generate several coupons of different denominations and provide them on one or more items. Produce a discount/credit coupon that is valid between a specific time ranges. Wisely value the coupon. Advertise the offer in advance, you can even keep increasing offer cost as coupon start time comes closer. This will produce scarcity and fast people to purchase more and earlier. Create a group of coupons with WooCommerce Smart Coupons plugin – and export them to a CSV document. Now share this CSV file with the “deals” web page, so they can issue one coupon to each customer. You can import the CSV file back into your shop so when clients use the coupon, they obtain the promised deal. To make for a seamless experience, offer a direct link to the item on offer with the produced coupon in the URL. Produce a new page in WordPress, link it from a known spot on your site. And use shortcodes to display coupons for offers you have presently available. You can even use images, link them to an item web site and move the coupon code in the URL. This plugin link as many coupons as you like with a product,create and update coupons of a new type!!! This is perfect plugin, thank you! If you want convenient and familiar coupon management interface, choose this product!! Working excellent, thank you very much!! !